Spatial systems appear to exhibit often a complex pattern of socio-economic development, in terms of (un)employment, income, mobility, ethnic composition, and urbanisation rates. Their evolution is co-determined by such factors as: market proximity, labour and housing market developments, public amenities, use of and access to transport systems, socio-economic composition of the population, etc. In addition, a sine qua non for sustaining urban economic growth is the local or regional presence of individual and collective cognitive assets that favour knowledge acquisition and transfer, education, innovation, and creativity. In this context, social capital and spatial accessibility are critical factors. The present paper aims to provide an operational framework for mapping out and understanding the mechanisms which drive spatial systems from the perspective of the resilience of urban areas, in the light of their social capital in combination with accessibility. Particular attention is therefore given to the essential role of social capital and transport accessibility in shaping both the economic development of cities and the spatial pattern in the evolution of cities, in terms of, inter alia, education, age, ethnic composition, (un)employment, and socio-economic poverty. For our quantitative analysis of the Swedish urban system, a quantile regression model is introduced and applied in order to study which urban-economic factors in Sweden determine the different levels of social capital, which are seen here as the fundamental component of the resilience capacity of urban areas. Recent research in the social sciences has often centred on the concept of resilience as a general framework for depicting and analysing the dynamics of complex social systems, in particular from the perspective of the recovery of such systems after the occurrence of a shock or perturbation. This research has focussed not only on a conceptualisation of evolutionary trends in dynamic social systems (see, e.g., Boschma 2015), but also on an operationalisation of the notion of resilience by estimating measurable resilience indexes for such systems (see Modica and Reggiani 2015; Reggiani et al. 2002). Resilience appears to have a particular relevance in spatial systems, given the socio-spatial interactivity among actors and socio-economic phenomena in space and time (see e.g. Griffith and Chun 2015). For example, it may be interesting to know whether, where, and when a stable situation in a traffic system may occur after a disturbance caused by bad weather conditions or an accident (Caschili et al. 2015). Similarly, it is a relevant question whether a new equilibrium will emerge in an interregional labour market system after a large influx of labour migrants or, conversely, after a collapse of a major industry in the area concerned (such as in Detroit). The dynamic interactions of interconnected regions/areas are the result of the intertwined network interactivity and the geographical connectivity of spatial systems. This prompts, of course, an intriguing question concerning the role of accessibility in the transition dynamics within and between regions/areas. Accessibility may propagate external shocks, but may also be instrumental in achieving a faster recovery or return to the original equilibrium. In a recent study (see Östh et al. 2017) an applied modelling study was undertaken to estimate resilience indices for the municipalities and urban areas in two countries (viz., Sweden and the Netherlands), while simultaneously taking into account the influence of accessibility within and between these areas. The empirical results from this study clearly demonstrated the significance of spatial accessibility in the pathway towards recovery after a shock. Individual level studies of the relationship between accessibility to jobs and socio-economic belonging in Sweden also suggests that accessibility and social capital can bridge problems relating to shocks to the labour market (Östh and Lindgren 2012). Clearly, social capital may act as a stimulus for a solid and trustful economy (see, e.g., Putnam 1995; Westlund and Bolton 2003), and hence create a buffer against external shocks, but it may also create a conservative and inert attitude, and hence delay the dynamic response which may be needed to cope with systemic disruptions (Martin and Sunley 2006). Consequently, social capital is relevant not only for contacts between people, but also as the framework for human interaction and the substance of communication. Over the past decade the notion of social capital has attracted an enormous research interest at the interface of economics and the social sciences. In the meantime, there is an extant literature – both conceptual and empirical − on social capital; for instance, in the domains of migration studies, cultural diversity, community sense and loyalty, labour market functioning, social entrepreneurship, and so forth. A summary review table of some important studies on social capital can be found in Table 2 in Appendix, including both definitions of the main concepts and the principal aspects of the empirical analyses conducted. Each definition mentioned in this table is part of the social capital concept, which is seen as a key characteristic of a group, not of a single person. For this reason, an appropriate understanding of the term ‘social capital’ originates from the creation and improvement of social networks with, amongst others, friends, colleagues and neighbours. Clearly, some of the most common measurements of social capital concern membership of associations (educational, religious, sports, cultural etc.) and the quality and frequency of meeting people (such as relatives and friends). Such approaches represent also appropriate methods of calculating the coverage and extension of social networks in a certain community. On the other hand, trust in other people is also a widely included measure in the literature on social capital. Indeed, considering the definition provided by the World Bank, social capital is a feature that allows a group to collaborate in order to reach a common aim. In this sense, trust is a psychological feature that may be considered as a proxy for social capital. Moreover, it is important to highlight the presence of two different types of social capital, as this difference is particularly important in understanding how the cultural assimilation of migrants evolves. On the one hand, bonding social capital describes relationships established between individuals who are very similar in terms of origin, culture and religion. The result of social similarity is tight bonds for a particular group. For example, from the perspective of immigrants, co-ethnic social contacts are useful, in as much they provide assistance in job information and initial settlement, even if they could hamper relationships with the native population. On the other hand, what is called bridging social capital, which characterises those relations which exist among individuals who are culturally more different, produces an unequivocally positive long-term return. This situation includes relationships between migrants and locals, who can offer higher quality jobs, in addition to encouraging assimilation (see for details Chiswick and Wang 2016; Wang 2016). How social capital can be measured by resilience? If so, how does accessibility impact social capital/resilience? And how do individual socio-economic features impact on social capital/resilience? The significance of this research framework will be tested by means of detailed spatial data on municipalities from Sweden. In line with the objective of our research as outlined above, this paper is organised as follows. 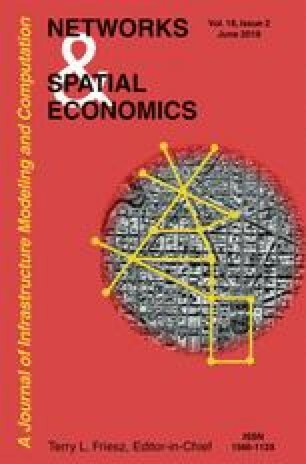 Section 2 is devoted to a literature review of the relevance of social capital in the functioning of socio-economic spatial networks. Next, Section 3 outlines the operational research framework following from Fig. 1. Section 4 describes the Swedish data used in our applied analysis, while Section 5 presents and interprets the empirical results. Finally, Section 6 makes some concluding remarks. With the aim of investigating the close relationship between social capital and resilience, the first methodological step is to deepen the concept of social capital. Given the complexity of the topic, the literature on social capital and social networks is extensive and varied, both empirically and theoretically. A major concern is, of course, the search for an operational proxy for social capital. Examples are: trust in other people (Beugelsdijk and Van Schaik 2005; Fazio and Lavecchia 2013; Laurence 2009; Lochner et al. 1999; Paxton 2002; Pichler and Wallace 2007; Poortinga 2006); membership of various types of association (Beugelsdijk and Van Schaik 2005; Glaeser et al. 2002; Grootaert 1999; Lochner et al. 1999; Paxton 2002; Pichler and Wallace 2007; Poortinga 2006; Portes 2000; Sabatini 2009); and the frequency of meeting friends or other people (Grootaert 1999; Portes 2000). In general, social capital refers to the possibility to realise various contacts and communication patterns (e.g. work, family, colleagues, etc.). In the field of regional science, a noteworthy study was produced by Westlund and Bolton (2003) who evaluated its impact on entrepreneurship and compared it with other forms of capital. In this section we highlight a few selected studies on social capital and focus, against the background of spatial and social networks, in particular on those related to accessibility at a local level. From the literature on accessibility, it appears that the extent to which services and activities can be reached is related to social capital. Several studies (see, e.g., Urry 2002) have revealed the significant impact of social capital on community transport and on the degree to which individuals who live in rural areas can participate in society, even without having their own car. Mobility is indeed considered as a glue for social connections which stimulate face-to-face contacts (instead of online social networks), and which improve trust and, consequently, social and economic inclusion. In this sense, a car is often an appropriate vehicle, which explains why car-drivers are often central in social capital studies. For example, Gray et al. (2006) have analysed in depth the impact of accessibility on social capital by focussing on mobility, which is just one specific component of accessibility. These authors have argued that social capital can explain how people who live in rural areas are able to ‘get by’ without a means of transport, and can, consequently, reach almost every place they want to. In this way, social capital may even be seen as a substitute good, when public transport systems are lacking or malfunctioning. Employment status is a relevant factor included in various studies on social capital and accessibility. For example, Buonanno et al. (2009) aimed to provide a novel contribution to the study of social capital, by considering it as a specific set of civic norms and associated networks. In order to reach their research objective, these authors also incorporated in their analysis, besides other variables, socio-economic determinants of the crime rate (such as income, education, urbanisation rate, and unemployment rate) in order to examine criminal networks. From the analysis of the results from their regression model, the sign of the variable concerning the unemployment rate appeared to be negative, as might be expected, though it was not very significant. Earlier, Brehm and Rahn (1997) tested the existence of a negative impact of unemployment rates, in addition to that of income inequality, on the level of interpersonal trust evaluated individually. It turned out that the unemployment rate, included in their analysis as a measure of economic performance at the collective level, is negatively related to confidence in federal institutions as a proxy for social capital. The significance of the aggregate unemployment rate is proof that social capital is affected by community characteristics, in addition to individual features. The above findings demonstrate that social capital is an aspect related to a group, not to a single person. Workplaces are often also social meeting places. Glaeser et al. (2002) have analysed the influence of occupation on social capital, in particular by testing the hypothesis that individuals with a socially-oriented occupation (e.g. physicians, clergymen, food-counter personnel, etc.) possess a higher level of social capital compared with other people who are involved in a more individualistic kind of job (e.g. textile operative-knitters, billing clerks, and musicians), for whom the presence of contacts with people in the workplace is likely less critical. Clearly, some research results demonstrate that occupational status partly determines social capital. For example, Bankston and Zhou (2002) showed that family occupational status (like educational background and income, which can be regarded as a form of human or financial capital) may have a positive influence on beneficial relations and networks among individuals, while it may also be a source of values and norms which lead to productive behaviour. The authors find a positive correlation between socio-economic status and network ties, in particular considering the mother’s occupation, which is significantly related to the creation of ties among parents, children and their friends. Specifically, the mother’s occupational status appears to have a negative sign: if a woman has a profitable job, the family to which she belongs is characterised by only a few bonds. The father’s occupation, instead, is less significant in the regression model on social capital (measured by such variables as association membership). In a study on Germany by Völker and Flap (1999), the authors focussed more on factors which influenced a person’s first occupation and their rights before 1989, when – with the fall of the Berlin Wall – the communist regime collapsed too. The study confirmed a positive effect of a person’s social position on the achievement of a certain job, and consequently on his/her occupational status, while acquaintances appeared to have a greater influence compared with friends and relatives. Related studies on the impact of the workplace on social capital can be found in Drukker et al. (2003) and Seibert et al. (2001). The former examined the influence of the socio-economic status of neighbours on social capital formation. The related results of these studies demonstrated that inhabitants living in deprived neighbourhoods help and trust each other, in contrast to people living in wealthy districts. The aforementioned study (Seibert et al. 2001) proved that an occupation categorised as ‘general management’ is positive and significantly correlated with the variable ‘contacts in other functions, that is the number of individuals who were identified as members of a different function’ (Seibert et al. 2001, p. 226); in other words, with the number of employees for each kind of work. It is often claimed that also education has an influence on someone’s social abilities. According to Helliwell and Putnam (1995, p. 1), ‘education has external effects, as well as internal ones. In principle, my behaviour can be affected not only by my education, but also by that of others around me’. In general, in this analysis a positive relationship is found between education – both on average and on the individual level – and social trust, which can be interpreted as a form of social capital. The significance of these results depends on the measure assumed for trust, depending on the data set used in the analysis. The importance of education for social capital, though always positive, varies, depending on the specific concept used, for instance, association membership (Helliwell and Putnam 1995). The knowledge level of people also appeared to influence in a positive way political participation, which may be another proxy for social capital (La Due Lake and Huckfeldt 1998; Nie et al. 1996; Putnam 1995). People characterised by having a higher education are indeed more likely to be active in the political environment, given that they are in possession of the necessary skills and knowledge base to understand the complex process created by politics. Migrants often have a shared cultural background. Defining immigrant culture as ‘the “original” culture of a group, consisting of an entire way of life, including languages, ideas, beliefs, values, behavioural patterns, and all that immigrants bring with them when they arrive in their new country’ (Zhou and Bankston 1994, p. 822), the relationship between social capital and migration has become a very timely topic (see Wang 2016). The literature often describes migration as a negative social capital factor, weakening relations and trust among community members. In Cheong et al. (2007), migration is perceived as a negative phenomenon for native people in the country which hosts immigrants. This negative perception of migrants has played a critical role in the recent Brexit discussion and in the US election campaign: many people were afraid of multiculturalism as a threat to social cohesion and national identity. Furthermore, association membership in minority ethnic groups is not considered as an opportunity to meet other people and to compare oneself to them, but as a way to strengthen relations with individuals belonging to the same race or culture (Cheong et al. 2007). For this reason, bonding social capital among minority ethnics groups is not so beneficial. In contrast to bonding social capital, bridging social capital1 is often regarded as a positive feature, and is thus promoted through, inter alia, a common language and citizenship courses. Age may be another determinant of social capital. Empirical analyses show an ambiguous relationship between social capital and age. Generally, a positive relationship between age and social capital is found: that is, an increment in age tends to increase the measure for social capital (Glaeser et al. 2002; La Due Lake and Huckfeldt 1998; Lancee 2010; Seippel 2006). This means that an old person is more likely to attach a high value to social capital (trust in other people, frequency of meeting friends and colleagues, etc.). Clearly the results also depend on the adopted social capital measure. Thus, with regard to political participation or trust in other people, age appears to have a positive effect on social capital. It is noteworthy that these findings may change if social capital is measured by the degree of being socially involved (Leyden 2003): when people become older, they are less inclined to be social. A similar result is obtained taking into account association membership in general or discrimination based on the type of association (Seippel 2006). An interesting result, though different from the aforementioned studies, is given in Fig. 2 by an inverse u-curve for social capital: it rises and then declines as people’s age increases, with a midlife peak (Glaeser et al. 2000, 2002). This thesis is supported by Kapucu (2011), since in that study the age groups with the highest social capital level are represented by ‘young adults’, who are those individuals aged between 18 and 30. That author supports this result, affirming that young people are involved in a more intensive process which allows them to often meet new people, who may also belong to different cultures, while older people usually have a more routine life. Finally, poverty, the inability to cover the basic household’s needs and the necessity to require help from relatives and local associations, is particularly related to the concept of social capital. Indeed poor people are characterised by strong ties with people belonging to their own family, what is – as mentioned above – called ‘bonding social capital’, who alleviate their poverty status by helping each other every time someone has any economic, health or other type of problem (Cleaver 2005; Knack 2002; Morris 1998). Indeed, poor people’s life is based on a mutual exchange with their relatives, in order to support their children and to overcome each problem. Warren et al. (2001) add a consideration about the importance of bridging social capital for a community which cannot solve its problems by building only internal social capital. Some ties with quite different individuals might be useful and bring advantages for the community. In the long run, this can help to reinforce the whole society and to reach a consensus about alleviating poverty. Moreover, the highest impacts of the return from social capital are recorded among the poorest countries and individuals. Indeed, in poorer communities social networks are an important source of knowledge, and might substitute formal education. For this reason, the term ‘social capital is the capital of the poor’ (Grootaert et al. 2002, p. 30) may originate from these greater returns compared with those to the richest communities. In the next section we discuss how resilience and social capital can be linked and how accessibility can impact both. The above mentioned factors will now be integrated in a more comprehensive explanatory model incorporating social capital/resilience and geographical accessibility, in addition to other socio-economic factors, as will be subsequently illustrated. Resilience is a phenomenon responding to some internal mechanisms of adjustment following an external shock. In this sense, resilience may be defined as the capacity of a system, in the presence of a shock: (a) to bounce back to a stable equilibrium point; or (b) to absorb the perturbation in order to reach a new equilibrium. Thus, resilience may be seen as a recovery rate which captures the capability of a certain area to be prepared for a potential change in the surrounding environmental or contextual conditions in order to properly respond and, consequently, to recover (Reggiani et al. 2002). Indeed, a fundamental role in determining resilience and the capability to recover is played by the quality and the spread of social and community networks. After a natural disaster or another external event with negative consequences, improved social connectivity corresponding to higher levels of social capital may turn out to be more important than other factors such as a large amount of resources from government assistance. This is due to the solidarity and altruism spread in a community with high social capital, which facilitates cooperative action and a more effective reconstruction after a shock. Nowadays, this is still valid for highly affected or damaged communities, even those with a low income and excluded from aid benefits. On the other hand, neighbourhoods with a low level of social capital in the event of disaster are not able to work cooperatively in order to ask assistance from public authorities and to rebuild the entire community (Aldrich 2012; Aldrich and Meyer 2015). Moreover, it is worth highlighting that bonding social capital, which concerns the relationships between very close people such as family or friends, may have a particular positive effect on recovery. Clearly, a community is able to receive early warning and prepare for a disaster, and is thus capable of finding the best way to provide shelter and supplies of relief goods (Hawkins and Maurer 2010; Heller et al. 2005). It is also obvious that strong bonding social capital might improve the already-existing discrimination, and support the provision of assistance only locally, instead of on a larger scale, thus further harming those who were previously already on the margin of society (Aldrich 2012). This means that breaking out components that can be associated with social capital from a more general indicator of resilience in an analytical framework could generate more knowledge about the role of social capital in the event of shocks. Given these premises, in this study social capital is assumed to be proxied by the third component of Resilience Capacity Index (RCI; Foster 2007), i.e. the community connectivity indicator identified by four variables of RCI, viz. civic infrastructure, metropolitan stability, homeownership and voter participation, as specified in the subsequent sections. Furthermore, a central mechanism in coping with shocks and in re-establishing an equilibrium is the role of geographic accessibility, e.g. in transportation networks. Improved access to economic hubs impacts the resilience, thus facilitating the recovery. In this sense, rural villages may be more affected by a financial crisis or a natural disaster, such as an earthquake, because of the lack of supporting infrastructures. A more detailed analysis of accessibility issues can be found in Reggiani and Martín (2011) and Reggiani et al. (2011a, b). Accessibility has often been treated in isolation from other behavioural factors as a key issue in transportation science. More recently, this concept has also been included as an important interconnected socio-economic research topic in (transport) geography (see for instance: Taylor et al. 2006). An interesting overview can be found in Farrington (2007). Studies on the relationship between access to transport systems (and amenities) and social exclusion (e.g. through social networks) have been rather rare in the past literature. A noteworthy exception is a study by Gray et al. (2006), who found that local social capital may facilitate mobility of specific groups in a community. Another interesting study on accessibility, mobility and transport-relative social exclusion can be found in Preston and Rajé (2007), who addresses the political economy of socially excluded immobile people in the UK, based on Amartya Sen’s theory of entitlement. In the same vein, also various studies have been carried out on the relationship between rural accessibility and social networks (see e.g. Farrington and Farrington 2005; Nutley 2003). There is certainly a need for a more comprehensive analysis of spatial accessibility in relation to other socio-economic variables impacting social capital/resilience and thus urban economic growth. It should be noted that the conventional RCI – adopted in the present work – does not take into account any accessibility or mobility indicator. Consequently, accessibility is assumed here as external variable impacting social capital/resilience, as also indicated in Fig. 1. The next section will describe the data set and explains in what way accessibility and social capital/resilience are linked in a regression analysis. We first describe the source of our data and the regression variables. The relationship between social capital/resilience, accessibility and geographic variables is a complex one. An appropriate method of analysis in this respect is quantile regression. In particular, the quantile regression technique provides a more detailed framework of the relationship existing between variables, by modelling quantiles of the conditional distribution of the dependent variable as functions of covariates (Koenker and Hallock 2001; Koenker 2005). In our case, quantile regression allows us to identify potential differences in the effect of the regressors on the dependent variable, that is, the community component of the resilience capacity index (RCI), representing here social capital. In this way it is possible to investigate whether social capital/resilience is differently affected by covariates across conditional quantiles of dependent variables. The prime data set used in this study concerns Sweden, and is derived from the Uppsala University-based PLACE database. PLACE contains data compiled by Statistics Sweden and holds longitudinal, individual level statistics relating to the labour market, education, and social sectors, from 1990 to 2014, for all individuals residing in Sweden. In this study, the individual level data have been aggregated to a municipality level in order to apply the quantile regression which operates at a macro-level (municipality). As anticipated, in the present work, social capital is proxied by the Community Connectivity Capacity (CCC), which is one of the three dimensions of RCI, and constructed to be a composite measure of four variables (civic infrastructure, metropolitan stability, homeownership, and voter participation) that correspond to representative elements of social capital. For the construction of the social capital vector, PLACE was used to create three of the four variables identifying CCC: a) civic infrastructure indicating the share of individuals employed in NGOs; b) metropolitan stability indicating the share of longer-time (5 or more years) residents in each municipality; and c) the share of individuals owing their own homes. Statistics from the Swedish Electoral Authority (Valmyndigheten) were used to calculate the fourth variable: d) voting share of eligible voters in each municipality. The final social capital vector was assembled on a municipality level by aggregating standardised scores from each of the four variables. The regressors were all constructed using variables derived from PLACE. They were chosen to correspond with the list of variables in Section 2. The accessibility variable represents doubly-constrained accessibility data on jobs in Sweden, where the median job coordinate for each municipality was used for the estimation of the distance between municipalities (i.e. the observed mean Cartesian distance between home and job was used to estimate within-border distance). The exponential decay function was used to mimic the friction of distance in Sweden (for details, see also Östh et al. 2014). The variable Immigration represents the share of foreign-born in each municipality. Working Income represents the average work-related income in each municipality in 2010. The share of Working People and Unemployed Individuals among individuals of employable age (i.e. 18-64 years of age) are represented in the corresponding variables; a third group consisting of individuals who are neither working nor listed as unemployed is excluded for multicollinearity reasons. Education is represented in the variables Vocational Education (work-oriented education at upper secondary school level), Academic Education (pre-university upper secondary school level) and Higher Education (university level). Compulsory education is omitted for multicollinearity reasons. The variable Rich People depicts the share of individuals who earn at least 140% of the median income in the year 2010. Finally, the share of individuals in different age cohorts is represented in the variables: Age 18-29, Age 30-39, Age 40-49, and Age 50-59. It goes without saying that the choice of these variables was inspired by the literature review in Section 2. The empirical work conducted here by means of a quantile regression focusses mainly on how accessibility, in addition to other socio-economic variables, can impact social capital measured by the community resilience indicator. Accessibility, the main variable of interest, is included in the regression as a doubly constrained potential accessibility variable with an exponential distance decay. The regression results, shown in Table 1, indicate that accessibility is significant as well as positively correlated with social capital. It means that an increase in accessibility corresponds to a rise in social capital. Indeed, in urban areas, opportunities for engaging in activities relating to education, religious activity, sports, culture, etc. is greater because of density of people. Consequently, social capital is here a widespread feature, while the opposite situation holds for some rural areas. Moreover, the coefficients of accessibility in Sweden appear to be more or less constant over all quantiles. In other words, the impact of accessibility on social capital is more or less the same for municipalities with both a high and a low social capital level (the accessibility trend is shown in Fig. 3). This means that accessibility has always the same influence, regardless the social capital level. This result is still valid, if the regression model also includes the variable ‘motorisation rate’ (Fig. 4). The difference occurs just for the lowest quantiles that represent those municipalities with the lowest values for the resilience index, for which the effect of accessibility is much smaller. Regarding the other variables resulting in significant and non-significant coefficients in the OLS and quantile regression, several of them confirm what other previous works in the literature have demonstrated (see the related trends displayed in Figs. 5 and 7 in Appendix). The Education trend reflects the expected correlation with social capital, as highlighted in the literature, in which higher education levels are positively correlated with social capital. In particular, vocational education appears to have a negative coefficient, reflecting a negative impact on social capital, which is instead influenced positively by academic and higher education (even if an educational qualification higher than a high school diploma has no significant effect). In a similar fashion, work income and immigration confirm most results found in previous studies, although here with a slight difference in terms of the impact on social capital depending on the quantile. In particular, working income, as well as education, appears to positively influence social capital, even though only for the highest quantiles, which correspond to municipalities characterised by a high level of social capital/resilience. This means that an increment in income originating from working corresponds to an increase in the dependent variable, and hence to higher levels of social capital. It is noteworthy that the coefficients regarding this variable, although not significant over all quantiles, follow an increasing trend across quantiles, revealing a positive effect only in municipalities described by a high level of social capital/resilience. The immigration variable, measured as the number of individuals migrating to Sweden in the last five years, shows a negative sign. This result is in line with previous research. Most of the remaining variables do not confirm the expected trend as indicated in the literature. For example, the variable for wealth, measured by the number of rich people, is – contrary to what has been found in previous studies – characterised by a coefficient with a positive sign for all quantiles. This means that increasing income levels are accompanied by higher levels of social capital. This effect appears to become more pronounced for the lowest/median quantiles. Occupational status, included in the regression model through two variables – one for working people and one for unemployed people –, is characterised by a positive effect on social capital for the lowest quantiles. On the other hand, the coefficients for working people, even if not significant across quantiles, reveal a more pronounced, both negatively and positively, impact on social capital. Finally, and somewhat unexpectedly, coefficients regarding age show that the only group of individuals who are able to increase social capital/resilience levels are those belonging to the youngest category, aged between 18 and 29. Remaining age cohorts are negatively correlated. The age results may indicate that the highly mobile groups of young individuals functions as a litmus–test to high social-capital places where universities and opportunity–dense locations attract younger cohorts. It is noteworthy that, even though more or less always significant, coefficients are constant across quantiles. The maps displayed in Fig. 6 show social capital predicted values for three different quantiles, 0.25, 0.50 and 0.75, in order to better understand the relationship between social capital and accessibility. In particular, those areas with a low level of social capital are coloured blue, while areas characterised by a high level of social capital are coloured red. Figure 6 confirms the results described above and shown in Table 1; that is, the absence of a clear spatial pattern depicting clear-cut relationships between kinds of places and social capital. Having said that, the maps reveal that major urban areas and knowledge cities are characterised by a high level of social capital. In these types of areas, opportunities for social engagements as well as recreative and intellectual activities are plentiful. The opposite is shown for the suburban municipalities surrounding the metropolitan areas where lower levels of social capital are clustered. These patterns are likely the effects of two major sorting mechanisms that are active in the metropolitan areas where the first effect corresponds to the function of the metropolitan landscape in which residential activities dominate the outer ring and activities such as intellectual activities, culture or sports are executed in the core, and where the second sorting mechanism corresponds to demographic and socio-economic differences, in terms of age, employment activities, income patterns, etc. The present work has aimed at analysing the relationship between accessibility and social capital/resilience; that is, in what way does accessibility impact social capital/resilience? The underlying motivation is to improve our understanding about the mechanisms that facilitate social capital/resilience on a municipality level, by incorporating a wider range of factors than strictly production-related, economic variables. The novelty in our approach is twofold: a) measurement of social capital by means of the community resilience indicator; b) methodological approach in which a quantile regression design allows us to trace relationships to accessibility as well as socio-economic and demographic variables at varying levels of social capital. In particular, in this study, social capital has been identified and measured by an important component of the RCI (Resilience Capacity Index), i.e. the community connectivity capacity. This variable comprises civic infrastructure, metropolitan stability, homeownership, and voter participation, in addition to other socio-economic variables (education, income, occupation, immigration, poverty and age). On the basis of the literature review, the independent variables which have been taken into account in this model were: accessibility, education, immigration, income, (un)employment and age (as cohorts). In order to highlight potential differences in the impact of the regressors on the dependent variable, a quantile regression was carried out on the basis of data concerning the Swedish municipalities. the strongest and most significant coefficients are found among the age and education variables. In more detail, our analysis has highlighted that an increase in accessibility corresponds to a rise in social capital, but the results also suggests that the impact of accessibility on social capital is constant across quantiles. This means that accessibility has as much influence on areas with high social capital as on other areas. Most of the other regressors appear to be significant for the highest quantiles. In other words, the impact of some variables, such as education and age, on social capital/resilience is actually relevant just for those municipalities characterised by a high level of social capital. There are several directions in which our analysis could be extended or deepened at a later stage, from both a methodological and an empirical point of view. First, even though the quantile regression was demonstrated to be a novel and suitable method for our purposes, additional approaches (e.g., based on spatial econometrics) might be applied, in order to show different spatial/temporal aspects of accessibility vs. social capital. Secondly, an extension of the model taking other relevant variables into account might also be considered. For example, social capital might be measured by means of a new indicator, which takes into account complementary aspects of this multifaceted concept, such as degree of trust, number of contacts with other people, number of association memberships, etc. In addition, the model might be expanded by including supplementary regressors, according to the literature discussed above, such as: number of hours spent in the office or local crime rates. In sum, these results call for further research, which would mainly serve to further test the structural spatial model and to provide additional extensions in different countries/areas, where social capital/resilience and accessibility may display different place-based characteristics. The term ‘bonding social capital’ refers to the ties within a homogeneous group of family or friends; on the other hand ‘bridging social capital’ indicates relationships between heterogeneous groups, in terms of culture or religion (Putnam 2000; Woolcock and Narayan, 2000).